Today I’m sharing red bulgur, or a bulgur pilaf with tomatoes, eggplant and chickpeas. Do you now why this dish is called red bulgur? I’ll give you one guess…that’s right…tomatoes! Tomatoes are the real star of this dish, especially if in season, but even if you have half-decent tomatoes, they will work just fine. And if your tomatoes are just horrible, canned is a great alternative. Red bulgur is a popular dish throughout Syria but mostly consumed in Homs, Hama and the surrounding areas. Farmers also love to eat bulgur dishes. They’re light and nutritious, perfect for sustained activity. 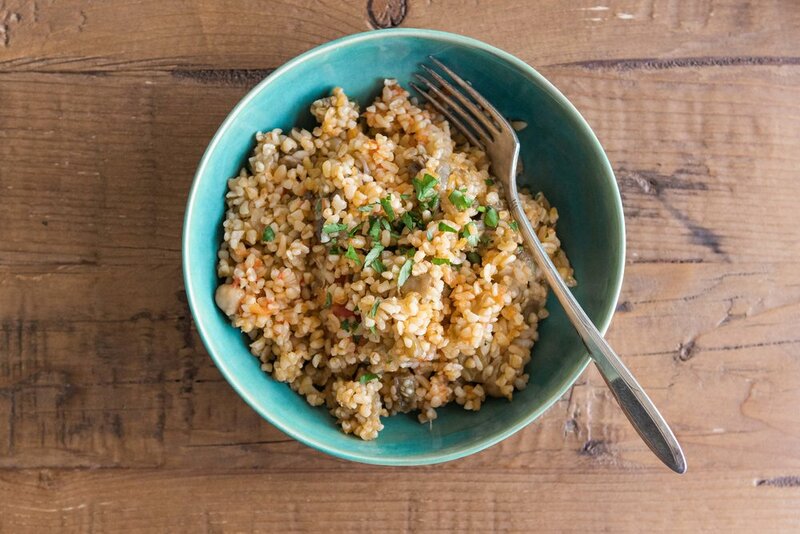 Red bulgur is traditionally made with just onions and tomatoes, and it can be vegetarian or cooked with meat. My grandmother loved the vegetarian version and added eggplant and chickpeas for more flavor and nutrients! The best part? There’s only 6 ingredients, and it’s super simple to make! I really hope you love it. If you give it a try, don’t forget to put it in the comments and tag #omayahcooks and @omayahatassi on Instagram! Delicious and nutritious bulgur dish with fresh tomatoes, eggplant and chickpeas. Super simple with only 6 ingredients. In-season tomatoes work best here. Otherwise, canned are just fine. Score the bottoms of the tomatoes and blanch in boiling water for about 30 seconds. Transfer immediately to ice bath, peel, chop and add to a medium stock pot. Cook over medium heat, mashing with a potato masher, until a puree forms. Continue cooking for another 15 minutes. Alternatively, heat the canned tomato puree over medium heat. Add the onions and olive oil to another medium stock pot over medium heat. Cook, stirring frequently, until softened and beginning to caramelize, about 15 minutes. Add eggplant, 1 tsp of salt and 7 spices. Continue cooking until eggplant is softened, about another 15 minutes. Add chickpeas, bulgur and remaining 3 tsp of salt. Dilute the tomato puree with a bit of water. Add 2 c of tomato sauce to the bulgur mixture and bring to a boil. Cover, reduce to low, and cook for another 20 minutes or until the water is absorbed. Adjust seaoning and serve immediately or reheat before serving.